GamerChris had a game day at his house this past Saturday. He was calling it RPG or Die! reflecting the fact that it had been postponed several times. But I’m very happy to say it went off without a hitch this time. The participants were: husband and wife team Britt and Carol, Kenny, Chris, and myself. Britt and Carol were not arriving until about noon so Chris, Kenny, and I went through a playtest of character generation for Comatose. It went well. They helped me identify some issues and see that I had some parts working well. Several questions and suggests came out of this that will help me move forward. The most important of these is that this is a horror game and I need to focus on that. Britt and Carol arrive in perfect timing as we finished the playtest. Lunch was served and we got to know each other. After lunch Chris had a game of Dread planned. He had even purchased the Onyx version of Jenga to be more in the correct mood. And he had created a soundtrack for the game also complete with sound effects! It was pretty cool. Chris built a fantastic scenario with werewolves and army types and innocent victims. I was a homeless Army interrogator and I ended up sacrificing myself so that Carol’s character, Mary Jo, could escape. There was much self-sacrificing in the game. Mary Jo was the only one to survive. That is one of the interesting things about Dread. Characters will die. It is unavoidable. Either the tower will fall or you will go out in a blaze of glory but someone is going to die in this game. And Chris brought out something about it that I hadn’t really realized – it is pure role-playing. There is barest minimum mechanics using the Jenga tower. The rest is Role Playing. And there was a lot of excellent role-playing. Kenny is very creative and quick minded. He came up with some neat stuff. And Britt was amazing. He stayed in character pretty much the whole game except when he needed to make a pull. And he is the Jenga King. Carol was really good with her character and added a lot to the game. I didn’t know until after the game that this was her first rpg. Much fun and very tense. We played Fiasco next after supper. WHAT A BLAST! You have to play this if you haven’t already. This is such a great game. It builds very interesting characters, a fun and catchy story, and the collaboration in it is sweet. We played ‘In a Nice Southern Town’ playset, of course. Boy did it rock. We had two thieves Tick (me) and Red Apple (Kenny) who stole copper and worked out of a cheap motel. Red was part owner of the motel with his cousin, Kandee Apple (Carol). Kandee was the daughter of Louis Apple (Britt). Sargent Nate (Chris), Tick’s parole officer, rounded out the group. In the end, Louis and Nate were in jail for various reasons. Red and Tick were dead. We learned how Louis’ wife and Red’s mom died. And Kandee ended up running a cheap motel in Atlantic City. Much hijinks happened between. This will probably become our go to rpg. The only down side was we didn’t get to chargen for Diaspora, which would have been cool. 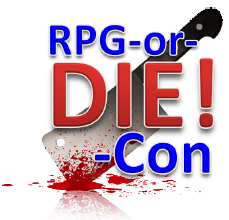 RPG or Die! con was crammed full with awesome. Chris and his wife were excellent and gracious hosts. The group meshed well and I hope we are able to get together again soon. UPDATE: Chris has posted on the first two sessions here and here. Go Forth And … you know.